If anyone in this "great" land knows anything about renovation, it may well be presidential hopeful Donald J. Trump. A veteran of the real estate industry for several decades now, Trump surely has renovated his share of properties, buildings and even golf courses. His latest project, however, could be his most ambitious: the Bill of Rights itself. 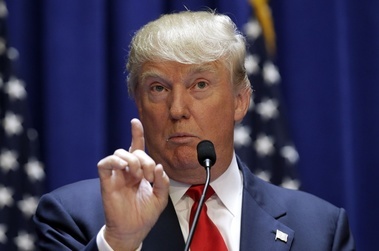 "Look at this thing," The Donald said as he held a copy the seminal American document before a crowd of reporters. "It's old. I mean, it's old, like really old. You hear what I'm saying? It is old." When asked what his intentions for the document were, Trump proposed a "renovation" of the foundational document "just like he would any of [his] older buildings that didn't cut the mustard anymore. I mean, Ivana wasn't cutting it anymore, so I got Marla Maples. New is better. I think we all know that, new is better. New equals better. Sometimes you have to tear something down to make something new, right? And then it's all better." When asked what he specifically meant by "tearing down the document" that is the basis of this country's inalienable rights, Trump continued, "Hey look, I don't know when this thing was written, probably a long time ago, like in the 1920's or something, but it doesn't make any sense anymore. I have a real problem with an old, stinky document telling me how to live my life. If we're gonna make America great again, the first thing we have to do is make these document new again, and that's what I'm gonna do on the first day in office. Bingo-bango, new document for the new America. I mean, really, no one reads this stuff anymore." The presidential hopeful was then asked how he planned to rejuvenate the Bill of Rights. "First of all some of this spooky language needs to get cleaned up. Like how is a working-class guy like me, the average citizen, supposed to understand this stuff? The trial of all crimes (except in cases of impeachment, and in cases arising in the land or naval forces, or in the militia when in actual service in time of War or public danger) shall be by an Impartial Jury of the Vicinage, with the requisite of unanimity for conviction, the right of challenge, and other accostomed [sic] requisites; and no person shall be held to answer for a capital, or otherways [sic] infamous crime, unless on a presentment or indictment by a Grand Jury; but if a crime be committed in a place in the possession of an enemy, or… blah, blah, blah. Vicinage? That's not even a word, is it? Unanimity? Impeachment? These aren't words like hammer, dumptruck or bigly. They're talking in circles. That's right, they're talking in circles. So that one's gone. Just out. Accostomed? Otherways? These Founding Father clowns can't even spell!" Trump's furor grew as he read more of the document. "Freedom of religion? No one goes to church anymore. Who cares? That one's going too. All it does is protect these Muslims who blew up buildings. God forbid they blow up my towers. That's out. Freedom of speech? Freedom to lie, that's what I call it. Freedom to lie, like those bastards on CNN and Hillary over there. This seventh here, that's a doozy. It says in "all matters involving more than 20 dollars". That's a joke. I tip 20 dollars at Starbucks when I get my coffee. That one's out. "Due process of law" … another joke. Out! This third one, "quartering soldiers," what's that? I have waaaay too much respect for our soldiers to start chopping them up into quarters. I mean, that's like serial killer stuff, right? No, absolutely not, I will not chop up soldiers. On my first day in office, I will find anyone who is trying to chop up American soldiers and make them pay." When prompted that he may be misinterpreting the articles in the Bill, Trump lashed back. "Of course I am! Look at it some time. Who can understand this stuff? Of course I'm misinterpreting this stuff. Maybe this is how they talked in the 1920's, but not now, not in Trump's America. And the ideas are just stupid. Look at this fourth one. No illegal "search and seizure"? If I can't walk into someone's house and arrest him, how am I gonna maintain law and order? If I can't just take someone's stuff, how am I gonna know what's going on in this country, huh? You tell me. And this old piece of paper is trying to tell me when I'm president - not if but when - I'm gonna restore law and order. This fourth one, how many shootings in Chicago happened because my police have their hands tied by this stupid fourth amendment. I mean, that's what I'm gonna do, starting on the first day of my term. The very first day. Here's another peach: no "cruel and unusual punishment." What's that? How else do you deal with terrorists? That's why we got soft. These terrorists knew they could come over, bombs some buildings, kill a bunch of people and know this piece of paper was gonna make sure they didn't get their precious feeling hurt. First day in office, that one's out!" One reporter asked The Donald if he knew that the "stinky, old" document he was holding was supposed to protect the American people from injustice, and false legal claims. (He was also asked if he knew what "quartered" meant). "Hey, I'm not saying people don't have rights. People have rights. Of course people have rights. Sure they do. I'm just saying they don't need all this stuff. The first day I'm in office, the very first day, I'm gonna make a nice simple list of rights, you know, without all this fancy nonsense. It's outdated. We need something for 2016, something nice and simple." Trump then said he had to meet with his team of architects and engineers to draw up plans for a wall along the southern border of the US, which he would start building on his "very first day in office."